10. Canada Thistle (Cirsium arvense) is one of the most common weeds found throughout North America. Mowing or pulling of this weed is not effective because it grows again from buds on the roots. The roots may extend into the ground 10 feet or more, so cultivation is ineffective, and may worsen a Canada thistle problem. 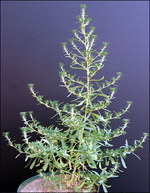 Research has shown that biological and chemical controls are compatible for musk thistle. See CSU Extension Fact Sheet #3.108, “Canada Thistle” from www.ext.colostate.edu for biological, chemical and mechanical assistance in eradicating this invasive weed. 9. Prostrate Spurge (Euphorbia maculata) is a late-germinating, low growing, mat-producing summer annual. Spurge is very often found in un-irrigated bark mulch. Spurge will tolerate some shade but thrives in full sun sites. The reddish, hairy stems of spurge will produce milky-white latex when broken or injured (similar to dandelion). All spurges have milky sap, which can be toxic to some animals and may be a skin irritant to humans, so wearing gloves is advised. Ground spurge and creeping spurge grow prostrate like spotted spurge but have no markings on their leaves. All spurges reproduce by seed, and creeping spurge also can produce roots along the stem, creating new plants. Constantly monitor infested areas, and mechanically till or hand pull new plants before they produce seed. Mowing is an ineffective method of control. The most common strategy for controlling weeds in ornamental plantings is to use mulch, which prevent light from reaching weed seeds and seedlings, starving them before they can start making food through photosynthesis. 8. Common Purslane (Portulaca oleracea) has a prostrate growth habit in combination with a fleshy, succulent nature that helps to distinguish it from most other garden weeds. Purslane is an annual weed that germinates after the soil warms in early summer and produces fifty-two thousand seeds per plant. Purslane seeds are viable for twenty-five years, so the best way to control purslane is to keep it from producing seed by hoeing it out of the garden, but it can redevelop from the taproot left in the soil. Plants pull out of moist soil easily, but it’s important to bag and discard pulled plants, as those left on a moist soil surface can re-root. Eliminate purslane as soon as it’s identified and before flowering. Purslane is edible as the leaves make a spicy addition to salads. 7. Common Mallow (Malva neglecta) is found throughout the U. S.. It is a low growing weed, with a deep fleshy tap root frequently found in newly seeded lawns or lawns that are stressed and lack density. The foliage resembles geranium leaves. The flowers of common mallow are pinkish-white and the fruits look like small, round cheese. Mallow spreads by seed that germinates through the summer. Broken stems can also root. Common mallow can be controlled by hand-weeding, hoeing, and lawn care cultural practices. Read CSU Fact Sheet #7.202, “Lawn care” for more lawn care tips. 6. Creeping Bellflower (Campanula ranunculaides) is a perennial weed that can cause serious problems in yards and gardens, even though the blossoms are pretty. “Garden Flower Run Amok” is this weed’s claim to fame, with a secondary explanation “Devours Landscape Ruthlessly,” finished by a plaintive “People Helpless.” By sight alone, it resembles a lovely bellflower. It is usually gown as an ornamental because of its pretty, bell-shaped blue to purple flowers. However, it can form dense clusters of leaves that can take over a lawn. The plant has heart-shaped leaves that taper to a long point. It reproduces by seed and by underground rootstalks. To manage this weed, dig it out. Because it has rather deep, horizontal fleshy roots, in addition to a shallow tuft of fibrous roots, dig down at least 6″ and several inches out from the plant to make sure all the roots have been found. 5. Kochia (Kochia scoparia) is a common broadleaf weed that becomes “tumbleweed” in the fall. These plants can be problematic in many situations where the soil is disturbed. These annuals can produce thousands of seeds per plant and the key to control is to prevent them from going to seed. If populations are intensively managed for two to three years to prevent seed production and no new weeds blow in, kochia can be eradicated because seeds are short-lived. Mowing can be effective on smaller plants. Tillage and hand hoeing can control both seedling and larger plants. Pre-emergent herbicides can provide some season-long control. Post-emergent applications are also effective if made when plants are small, less than 4 inches in diameter. 4. Puncture vine (Tribulus terrestris) is a low-growing, mat-forming plant with small leaflets and one-half inch wide yellow flowers. Trailing stems may reach one to six feet long in the summer. Hard spiny burs about one-half inch wide develop after flowering. These burs, which can easily puncture bicycle tires or a gardener’s skin, contain seeds. Herbicides provide effective control if they’re applied when the plants are young and small. If herbicides are used, be sure the herbicide product is labeled for control of puncture vine, and with any pesticide, read and follow label directions explicitly. For more information on puncture vine, visit www.planttalk.org and read script #2109. 3. Common Dandelion (Taraxacum officinale) grows best in moist areas with full sun, but it can survive some shade and dry conditions once established. It produces a strong taproot that is capable of penetrating the soil to a depth of 10 to 15 feet, but most commonly six to 18 inches deep. Buds grow from the uppermost area of the root, producing a crown that can regenerate “new” plants even though the plant is cut off at or below the soil surface. Sections of the root as short as one inch in length are capable of producing new plants. Dandelions are a major weed problem for turf and ornamental areas. Young plants can easily be hand pulled. Pre-emergent herbicides work well in lawns. Post emergent herbicides that control broadleaf weeds can control dandelion seedlings in flower beds. Dandelion leaves are edible and often used in salads. Just make sure they are harvested from areas free of herbicides. The flowers can be used to make dandelion wine. 2. Pigweed (Amaranthus ssp.) is a common annual garden weed with prostrate stems radiating in all directions from a central taproot. Leaves are small and egg-shaped, with the tip broader than the base and stems that are usually 12 to 18 inches long with shorter secondary branches. All stems are somewhat fleshy and pliable, nearly smooth, and usually red to purple. This plant prefers highly disturbed habitats with bare open ground. 1. Field Bindweed (Convolvulus arvensis) is one of the most invasive weeds in the U. S. It will run for 30 to 40 feet under landscape fabric and mulch to emerge to the sunlight. 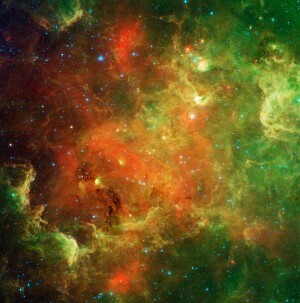 Once it gets a foothold, it is extremely hard to eradicate. 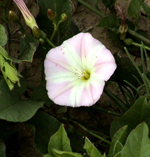 Field bindweed is a deep-rooted perennial weed that has adapted to most of North America. It is a native of Europe and western Asia and was introduced to this country during colonial days. Bindweed can be spread by seed, root fragments, implements, infested soil adhering to the roots of nursery stock, root growth from infested areas, and animals. This weed has a deep root system (20 feet or more) that competes with desirable plants for water and nutrients. Vines climb on plants and shade the plant hindering growth. Seeds may remain viable for forty years. The herbicide quinclorac (sold as Drive XLR8) is highly effective at controlling bindweed. Quinclorac is available to the homeowner in the products Ortho Weed B Gon MAX plus Crabgrass Control, Bayer Advanced T All-In-One Lawn Weed & Crabgrass Killer and Spectracide Weed Stop for Lawns plus Crabgrass Killer. NOTE: These herbicides are labeled only for use in lawns and can’t be legally or safely used in landscape beds or vegetable gardens. Be very cautious using these products in the lawn near vegetable gardens, as tomatoes, peppers and other solanaceous crops are very sensitive to quinclorac. Read Planttalk Script #2126, “Bindweed Control in Lawns” for more information. The biggest question for gardeners and weeds is, “How do I get rid of it? ” Understanding how the weed reproduces or spreads is important in identifying how to control it. A few simple things to note about weeds are (a) simple root systems succumb easily to foliar herbicides; (b) Taproots can break, and new plants will grow from pieces left behind; (c) Plants that spread by stolons can intermingle with desirable plants, making use of systemic herbicide dangerous; (d) Pre-emergent herbicides can help eliminate problems the following year. Vigilance is required to stay ahead of weeds, especially during quality growing weather. When those first green sprouts appear in the wrong place, start pulling. Summer is for other activities than weed-pulling. The author has received training through Colorado State University Extension’s Master Gardener program and is a Master Gardener volunteer for Larimer County. Visit PlantTalk Colorado ™ for fast answers to your gardening questions! www.planttalk.org PlantTalk is a cooperation between Colorado State University Extension, GreenCo and Denver Botanic Gardens. Site contents copyright © 2019 Recorder Online	except as noted. All rights reserved. | 90 queries in 2.178 seconds.